In that regard, Sonny and Sam find a locked manuscript. When they manage to open it, they release Slappy (voiced by Mick Wingert), a malevolent ventriloquist dummy who goes on to unleash all forms of monsters. Along with Sonny’s older sister Sarah (Madison Iseman), the boys seek to capture the creatures and restore order. That’s essentially the same plot to the 2015 movie, and we find some of the same critters as well. Again, Goosebumps 2 branches out enough so that it doesn’t quite turn into a remake, but it doesn’t open up enough to come across as fresh. The absence of Black – or someone of similar caliber – becomes an issue. While the three young actors at the core offer more than competent performances, none of them can carry the tale as needed. 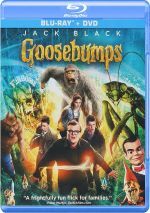 Goosebumps 2 appears in an aspect ratio of approximately 2.39:1 on this Blu-ray Disc. The movie came with a positive presentation. Sharpness worked well. Only some minor softness impacted a few wider shots, so the image usually offered tight, concise visuals. I saw no issues with jagged edges or shimmering, and the movie lacked both edge haloes and print flaws. Due to its Halloween setting, the film tended toward a somewhat subdued palette, with a moderate emphasis on the usual orange and teal. The colors looked well-rendered given the design choices, and a few more dynamic hues added life. Blacks were fine, while shadows seemed smooth and concise. Across the board, this turned into a satisfying image. While not exceptional, the DTS-HD MA 5.1 soundtrack of Goosebumps 2 suited the material. The soundscape offered enough action-oriented sequences to add pep to the package. As we shift to extras, we open with a Gag Reel. It goes for two minutes, 37 seconds and provides a fairly standard allotment of goofs and giggles, though a few improv lines add mirth. The disc opens with ads for Spider-Man: Into the Spider-Verse, Hotel Transylvania 3, Alpha, Goosebumps and Peter Rabbit. No trailer for Goosebumps 2 appears here. Because the first film offered a fun adventure, I hoped Goosebumps 2 would become another winner. However, the movie tends to drag and it never creates a tale with much imagination or spark. The Blu-ray comes with very good picture and audio as well as a decent compilation of bonus materials. Goosebumps 2 delivers an ordinary comedy-horror tale.